I have been using large format cameras alongside other smaller formats for many years. Large format cameras have traditionally been associated with the master photographers, or with high end commercial work, so when I began, I worried about getting ‘perfect’ negatives like the experts. It took me many years to understand that they could be used in a much more relaxed way too. I have 5×4, 5×7, and 10×8 cameras which all produce very detailed negatives. I can get high quality images from any of them if I need to, but sometimes I really enjoy using them purely for the fun of working in a different way. I often put unusual materials in the camera, such as X-Ray film, graphic Arts film, or Photographic Paper. These materials do not produce technically high quality negatives, but they do produce exciting and interesting images. All of the light sensitive materials mentioned above are rather slow, that is to say, they need much more light to produce an image. This is actually an advantage, as it means that I can do without a shutter to control the light. I simply expose by uncovering the lens for a period of time. This can be as little as a second, or much longer, -sometimes minutes. Choosing lenses without the need for a shutter opens up all sorts of possibilities. A high quality lens without a shutter is known as a Process Lens. These can be found on Ebay much more cheaply than the type with shutters built in. I have used process lenses, enlarger lenses, photocopier lenses and also simple optics such as a magnifying glass. All produce something unique and I find this really exciting. If you are shooting on slow, or unusual materials and not too concerned about having a really sharp, well corrected lens, then you have an enormous range to choose from. For the uninitiated, a general description of a process lens is; A lens without a shutter which gives a flat field of focus. These lenses have been made for copying and reproduction and are made for a particular application. Using them in a way that they were not designed for gives interesting results. They were designed to be flat field and were optimised for 1-1 reproduction (which makes them great for close up work). These lenses were used in the graphic arts industry for making printing plates and many of these lenses will give excellent quality if stopped down. Some are fixed at one aperture, so are only any use in low light or with very slow emulsions. Similar to a process lens, in that they are flat field, but with the advantage of having a variable aperture. Basically, they are process lenses mounted in reverse. 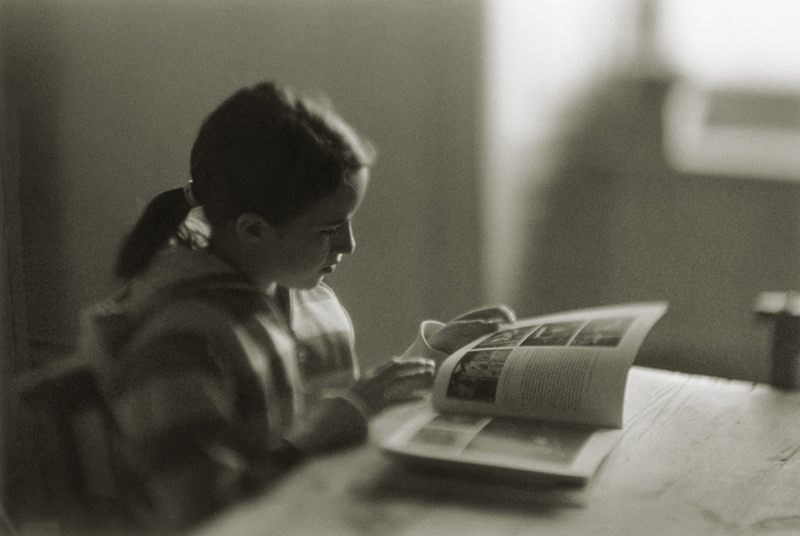 Any enlarger lens can be used on a 5×4 camera, but most will give only a small image on the film unless they are over 150mm focal length (5×4 camera). Some interesting results can be obtained using a lens which is too small, the most obvious being a totally circular image in the centre of the film. Again, these are process lenses, but they do not have a controllable aperture. They must be used wide open, this limits the situations in which they can be used. These are amongst my favourites, they are usually very bright lenses and give really lovely out of focus areas. In the picture above you can see an 89mm f1.9 Rosslyte projector lens attached to an Olympus OM10. An uncorrected (very soft focus), very fast lens with no aperture. The amount of light coming into the camera is often too much even for these slow emulsions. A makeshift aperture could be fashioned out of black card which would reduce the light and also give a clearer, sharper image, though this would still be soft in comparison with proper optics. Using Process, enlarging and simple lenses on a camera will give your images a different look from those taken using conventional optics. I am grouping these all together because I use all of them at various times to produce some of the work I am interested in. Each type has different characteristics, methods of use and drawbacks. Sometimes those characteristics and drawbacks cause problems out in the field, but they also are capable of beautiful results and that’s why I still think they are worth the effort. Obtaining these types of lenses is easy. Process lenses appear on Ebay regularly and do not generally cost much, -certainly nowhere near the original cost that they would have been when in proper use. Enlarging lenses usually go for less than £25.00. Camera fairs and antique / junk fairs occasionally have something of interest, -I found a 240mm f4.5 photocopier lens a few months ago which will cover 10×8. It only cost me £4.00. Anything you can get hold of is going to give you something different than the ‘normal’ optics that are supposed to be used on these cameras. Try it, see what sort of shot suits your unusual lens. Some things will be unsatisfactory, but other shots will be magical. I agree that these lenses are great to play with, especially on 4×5 and 10×8. Glad I found these pages and I wish you the best. I don’t quite agree with your definition of “process lens” however. Process lenses are usually optimised for 1:1 (as you say) but are optimised for low distortions, not flat field. Obviously low distortion is what you want when copying a map, for example. Most are not flat field but get very close to flat field when stopped down. The Apo Ronar, for example, is an excellent process lens that is often used pictorially (I have a couple), but is not adequately flat until stopped to about f/22. Enlarger lenses are however (at least supposed to be) flat field and are often better in terms of contrast, though perhaps not as sharp. Dear Richard, thank you for your clarification. i didn’t want to get into a big discussion about the finer details of what is and and what is not flat field, or process, I just wanted to inspire a few photographers who might not have considered these lenses for large format use. This entry was posted in 35mm, Large format, Uncategorized and tagged 35mm, Cameras, Experimental, Large format, lenses Large format, magnifying glass, Process lens, projector lens on October 8, 2012 by andrewsandersonphoto. Have enjoyed your blog posts very much. Was just reading your October 2012 blog entry on playing with various oddball lens and I am reminded of something I stumbled onto some time back. I have always wanted to take some macro shots with my 8×10 Ansco but of course none of my lens would focus anywhere near close enough to shoot a spider, bug, rare coin, etc., up close, and I did not really want to buy an expensive dedicated macro lens simply for occasional fun. I finally tried taping various salvaged lens onto the front of the original Wollensak lens and got nowhere UNTIL I tried the large front lens out of a common pair of junk 7×50 binoculars. Wow! I could suddenly focus quite sharp even right up within 4 to 5 inches of the lens! Also tried it on my 5×7 rig with same amazing results. Just common gaffers tape holding the binoc lens onto the front of the original lens each time. That is great Stewart! I love experimenting and playing about with lenses. Do you intend to continue with it? Regards, Andrew. 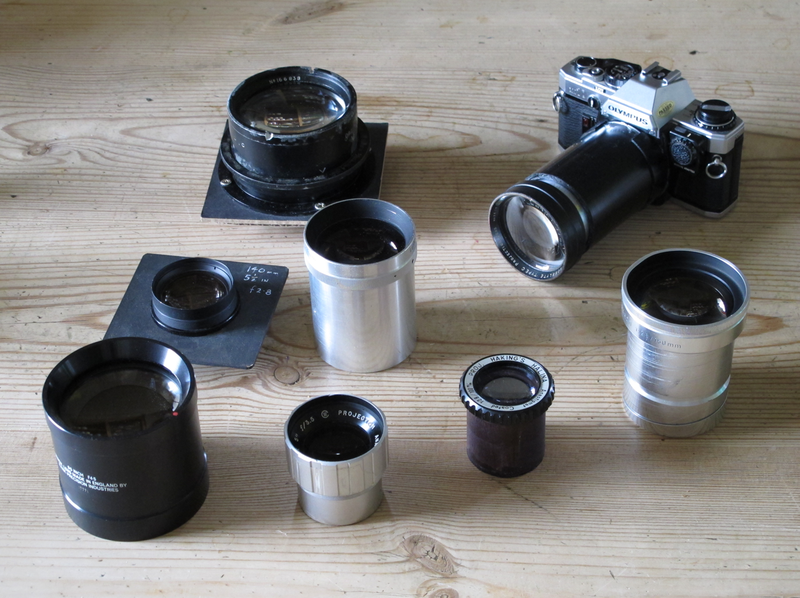 I have just salvaged two from lenses from an old pair of binoculars, I shall try this out. Thank you for letting me know.